We used Hellenic Holidays for our honeymoon and it couldn’t have been more perfect. 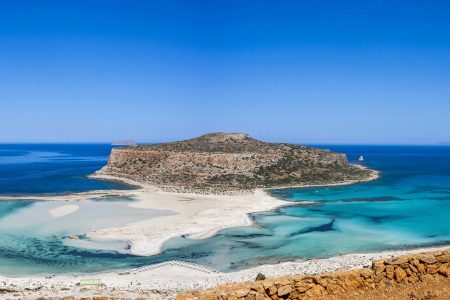 We chose a 2-week trip to Athens, Crete, Santorini and Mykonos. From the first conversation with Petros, I knew we were going to be in good hands. Hotels, private transportation, private tours, travel between islands, meals, excursions, etc. Everything was planned perfectly. We also had many days where there was nothing planned, which allowed us to explore the islands on our own time. Each hotel Petros picked for us was perfect. The day trips he planned for us (private walking tour of Athens, Santorini wine tour, Santorini dinner cruise) were perfect! Every single detail was perfect of our trip was perfect. Petros planned our dream honeymoon and we would recommend Hellenic Holidays to anyone who wants to go to Greece. Petros was an absolute delight to work with! Incredibly helpful to create our dream honeymoon plan in Santorini and Mykonos with a truly 5 star experience. He was highly responsive, negotiated great prices, and set up all the details so everything was incredibly smooth for us while we were traveling. From luxury car transfers to first class ferry tickets between the islands, we continuously said how much we appreciated Petros and all his hard work throughout our trip! 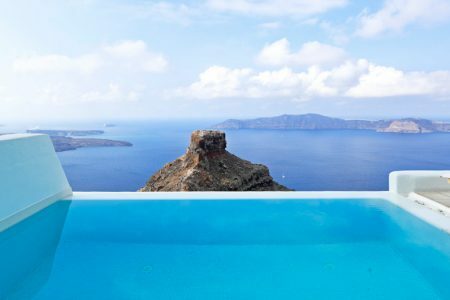 Santorini’s Andronis Luxury Suites in Oia and Mykonos Grand were the 2 hotels he arranged for us – HIGHLY recommend staying there for a truly 5 star experience. THANK YOU SO MUCH PETROS for ALL you did for us! An unforgettable honeymoon!!!!!! If you are looking for a stress-free, personalized, romantic, luxurious getaway to Greece, then you need to book with Petros from Hellenic Holidays. My husband and I traveled to Greece in early August shortly after our wedding. Our planning for traveling to Greece occurred when the U.S.’s media coverage of the country’s financial crisis was at its height. While this caused my husband to develop some second thoughts, Petros was not deterred and rightly assured we would be just fine. When we arrived in mainland Greece and made our travels through the Cyclades, we could not detect even a hint of economic turmoil, and our trip was not affected at all. Each of the locations Petros arranged for us to stay were breathtaking, gorgeous, and luxurious. Upon our arrival at each location, a bottle of champagne/wine and seasonal fruits/sweets welcomed us, courtesy of Petros. The personal touch made us feel warm and at home. Many of the staff we met actually knew Petros, evidence of relationships formed over mutual respect and frequent business with each other. When we ran into a bit of trouble with one of our afternoon transfers (due to an unexpected airline strike out of Petros’ control), we called Petros around 6AM eastern time, and within 5 to 10 minutes, he was able to arrange alternative transportation to our destination. This scenario showed us Petros’ above-and-beyond work ethic. We were very impressed by our trip’s smoothness, and enjoyed not needing to worry about checking into transfer flights or ferries –Petros completed all this for us remotely! While planning this trip, we desired something exciting, worthwhile, and memorable. Travelling to Greece exceeded every expectation we had for this honeymoon, thanks to Petros. If you are looking for a personal yet professional travel agent, who knows Greece like the back side of his hand, then you would be foolish not to go with Hellenic Holidays for your next Greek Holiday. Dear Travel & Leisure – I understand you are taking nominations for the Top Travel Specialist for Greece. Well, then I would like to officially and loudly nominate Petros Zissimos and Hellenic Holidays. He is/they are brilliant, hands on, caring, knowledgeable, and many more adjectives that I can include here. We immediately started planning the trip with me saying what I was looking for and Petros giving me the thoughts and ideas right back. And they were all marvelous thoughts and ideas. We started off in Istanbul being met by the nicest greeter and driver, and then were whisked off to a fabulous boutique hotel. When we got to our room, there were rose petals, heart balloons, heart candles everywhere – from the door to all over the bed… it was a marvelous way to start the trip (and with a fabulous room overlooking the gardens of the Topkapi Palace). I know Petros was responsible for that. Our private full day walking tour of Istanbul was great as was our guide and the restaurants Petros suggested were delectable (and that was throughout the entire trip. We took his food advice to heart and weren’t disappointed once). When it came time to leave for Athens the driver was there right on time and whisked us off to the airport where when we landed another smiling face met us and took us to the Grand Bretagne which could not have been a better choice of hotel. Then to Santorini, Crete, Mykonos and back to Athens. Everything was smooth, perfect, trouble free. We loved each of our hotels, sights, meals. It was really was the perfect 16 days and we would have never had it so easy if we attempted to do it ourselves or dealt with a faceless company on the internet. He specializes in this area and knows the locations, hoteliers, drivers, restauranteurs, and guides personally. So, I wholeheartedly nominate Petros G Zissimos and Hellenic Holidays as the Travel and Leisure Top Travel Specialist for Greece. Hellenic Holidays and Petros Zissimos did a fantastic job of planning our honeymoon to Greece. It was truly a dream vacation and more spectacular than we could have imagined. Petros covers all the details – upscale, beautiful hotels with beautiful views and a professional, friendly staff; private cars to get you to/from hotel and airport or seaport; flight check-in; excursion bookings; daily activity and restaurant recommendations and tips; and his cell phone number if you would happen to need his help! All of this so you can relax and enjoy yourself. I typically plan vacations myself, but we picked Hellenic Holidays because unlike other travel agents, Petros focuses on only Greece and Turkey to provide his customers with a higher level of service and expertise. His hotel, restaurant, and excursion choices (especially the sunset cruise in Santorini) and his attention to detail exceeded our expectations. I would recommend Petros to anyone planning a vacation to Greece and hope to work with him again one day in the future. It was a perfect honeymoon. Thank you Petros! After we decided on Greece as our honeymoon destination, the thought of poring over thousands of hotel options, planning airport transfers, and researching the best activities and restaurants in each location was the last thing we wanted to do while simultaneously planning a wedding. Enter Petros and Hellenic Holidays. From the moment we contacted Petros, we knew we had made the right decision. He made himself available to discuss what we wanted out of our honeymoon and was extraordinarily flexible to talk with our busy schedules. He was almost frighteningly responsive whenever we had questions (I e-mailed him in a panic about using the Euro currency during the Greek economic crisis, and he called my cell phone within 2 minutes of me sending the e-mail). When we asked for his advice on a particular subject (room upgrades, for example), he gave a straightforward, direct response based on his experience planning thousands of trips for his clients. More importantly, the trip was executed flawlessly. Petros’ network of drivers, hotel contacts, and restaurant recommendations made our experience in Greece a seamless, divine bit of serenity. From cold champagne awaiting us at our hotels, to bottled water and snacks awaiting us in our private airport transfers, Petros went above and beyond in every aspect of ensuring our trip was simply incredible. With Petros taking care of logistics, we were able to enjoy our time together and absorb all that Greece has to offer. I have rarely experienced the level of service that Petros provided for my fiancé and I, and I offer him a resounding, unequivocal recommendation for anyone that wants the quintessential Greek experience. My wife and I had gotten a late start to our honeymoon planning. We have traveled abroad several times, but with our hearts set on Greece we felt we should have the planning done by a professional. From the moment we met Petros Zissimos at Hellenic Holidays all apprehension and doubt about the details of our honeymoon vanished. Petros is a consummate professional who custom tailored our time in Greece to our specific set of interests, time frame, and budget. At every step of the process I had total confidence that we were in the right hands. I feel confident in saying that when it comes to travelling in Greece, you would find it difficult to find a more knowledgeable person with a true passion for the beautiful country he represents. Our honeymoon was out of a dream, taking us to the most beautiful places, seamlessly transitioning from one place to the next without a moment of stress that anything would be anything less than perfect. Every hotel and transportation arrangement made us feel special, with little niceties and warm notes congratulating us on our honeymoon. Our trip to Greece was a trip of a lifetime, all thanks to Petros at Hellenic Holidays. From sunset sailing in Santorini to personal guides in Athens, if you want an unforgettable experience in Greece, look no further. We had the most amazing experience on our honeymoon to Greece thanks to Petros and his team at Hellenic Holidays. From the moment we met him, Petros was friendly, accommodating, and extremely knowledgeable about Greece. The trip he created for us was absolutely perfect – the hotels, the restaurant recommendations, the private transfers – there was no detail left out! It was such a relaxing way to travel knowing that everything had been set up, confirmed, and taken care of for us before we even arrived. We flew from NYC to Athens for 2 nights, flew from Athens to Mykonos for 5 nights, and then took the ferry from Mykonos to Santorini for another 5 nights. Then back to Athens and home to NYC. It was the perfect amount of time and the perfect places for an unforgettable honeymoon experience. Use Hellenic Holidays – trust these experts! You won’t be disappointed! Look no further. Petros of Hellenic Holidays is the be-all, end-all Greek honeymoon planner. He planned the most romantic, luxurious trip to Athens, Mykonos, Naxos and Santorini. He organized every detail perfectly and it all played out seamlessly throughout all 14 days of our honeymoon, which is no small feat. His relationships with the hotel and restaurant owners creates a dynamic where you feel like you so at home and welcomed everywhere with open arms. Each of his daily recommendations were spot-on but most of all, each hotel he picked for us was one better than the next. We didn’t have to do one bit of planning for our honeymoon because we were so confident that we were in good hands with Petros and we were right. Even unexpected things that occurred that were no fault of his own (airline canceled our flight, we missed our ferry, etc. ), Petros was right there for us making all of our problems go away! I could not recommend Hellenic Holidays any higher–since seeing our Facebook pictures, at least 6 friends have asked for his contact information! We feel lucky to have found Petros. My Family and I just returned from our first amazing vacation to Greece. We spent two days in Athens plus three days in Mykonos and three days in Santorini. I started to plan this trip on my own in February 2015 and I quickly realized there were too many islands and venues. I also had seven family members traveling together which added logistical complications. While my family frequently travels internationally, I decided to use a travel agent to plan this trip (first time in 30 years since my honeymoon). As I was evaluating travel agents, I met with Petros Zissimos from Hellenic Holidays. Petros initially spent considerable time to get a real understanding of my extended traveling family. Who they were, their interests, their vacation priorities, any travel limitations, handicaps or relevant medical issues. With this information and my budget constraints, Petros quickly sketched out a preliminary itinerary. I did my own homework on his suggested hotels and we agreed on his initial proposal. Now that the trip was planned, I thought Petros had done his job and we were on our own. Not so. A week before the start of our trip, Petros scheduled a conference call to discuss the details of the trip, the logistical transfers, activities, tours and the restaurants we should consider for every evening of the vacation. During the trip, Petros would forward our “checked in” boarding passes for each flight. He notified each hotel of our arrival and our preferences. We really experienced a first class service at every point in our vacation. Our trip was a tremendous success and the experience of a lifetime; for every member of my family. I can honestly say that I could never have planned such a perfectly executed vacation on my own. Petros has given me great faith in the value provided by an excellent travel agent. I know that Travel and Leisure maintains an A-List of travel agents and that Petros proudly displays his past awards in his office. When I saw these awards, I googled the term and realized it is a prestigious recognition, reserved for the best in the field. After my personal experience with Petros I recognize him as a leader in his field and nominate him for the Travel and Leisure A-List. Petros and his team did a fantastic job planning and executing our honeymoon! It was absolutely spectacular. We traveled to Mykonos, Istanbul, & Santorini. Our planning was done on fairly short notice, yet Petros was able to put together the packages in no time. He has excellent connections that he works for you to stay in the most luxurious hotels with the best service you can imagine. Aside from the wonderful hotels and spot on restaurant recommendations, Petros provides you with a step by step guide to your vacation complete with suggested itineraries, daily lunch & dinner spots (each one was a success), and all your travel vouchers/etc. He tracks your trip and checks you in for every flight before you even wake up to get to the airport and coordinates with your hotels to make sure your cars are ready before you’re packed to go. Every single minute of our trip was special and we didn’t lift a finger to plan it. Thank you Petros! Not to sound like a cheesy infomercial actor but initially, I was totally against the use of a travel agent. I figured we would just be herded with the masses and seeing only the most “touristy” destinations in Greece; I could not be more incorrect. Hellenic Holidays and Petros worked very closely with my wife and I in order to determine what we considered a perfect Honeymoon… and man did he deliver Every time we entered a new hotel or showed up at a new location, we felt like we were in the silly commercials where “we got it booking right!”… Except we did not do anything. Petros took care of all the details and we just had to show up and have a blast. We worked with Petros and he was spectacular! He set up the most amazing trip for my husband and I to Athens, Mykonos and Santorini. It truly felt like a once in a lifetime honeymoon and not just a vacation. He goes to Greece every year to make sure the restaurants and the excursions he is suggesting are top notch, and EVERYTHING he suggested really was. He put together an itinerary for us that we referred to every morning. There was one day we didn’t take his suggestion for lunch and it was the worst meal we had all vacation! In his itinerary he would include notes about the cuisine and what is popular to order at that restaurant, or even tell us to ask for the owner by name when we go in. They were always so happy that Petros was the one sending us. We know that we couldn’t have planned such a wonderful trip without his help. He was a pleasure to work with from day one and even continued to check on us while we were away to make sure we were having a great time! I’m sure we would have never gotten the deals we did on our hotels and transfers to and from places without his help and connections. I would recommend working through Petros for your honeymoon to Greece and have recommended it to some of my friends already. Thank you, Petros!! If I could give 10 stars, I would! 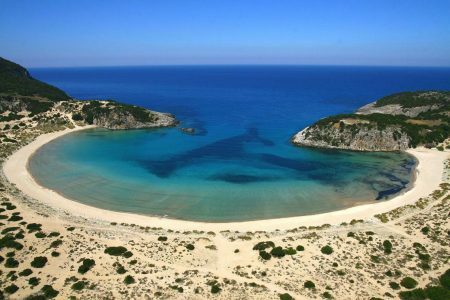 We found Petros with Hellenic Holidays in a google search when looking for a travel agent who specializes in Greece. We had a phone consultation and immediately knew this was the agency we wanted to plan our trip. It was the best decision we had made and one of the best experiences we have ever had with a travel agent and a trip overseas! Literally every detail was well thought and organized, and our trip went without a hitch. I have already referred 4 friends on to him because I want my friends and family to have the same incredible experience traveling throughout Greece that we had. His attention to detail is incredible, his follow through is timely and professional, and his insight and expertise into the Greece market is absolutely incredible. Our hotels were amazing, his restaurant recommendations were a huge hit, and our coordination of transportation between locations was timely and stress-free. I HIGHLY recommend using Hellenic Holidays if you are planning a trip to Greece and/or Turkey, you will NOT regret it!! !